Families who own a dog always have that extra headache at holiday times about what to do with their beloved pet. Some people are fortunate and have relatives or friends whom they trust to take good care of their dogs whilst they are on holiday, however, for many this is not an option. This is where dog-friendly holiday cottages, and pine lodges, are a real godsend. It is so much less expensive to take your dogs on holiday with you when renting self-catering accommodation. A proportion of holiday accommodation is allocated to guests who bring dogs. Sometimes there is an extra fee for the dogs, but in many cases there is no additional charge. It is worth shopping around to find the best pet-friendly bargains. Consider last-minute holiday cottages for those discounts or travel to more remote areas that may be cheaper, assuming that you and your dogs can cope with the distance. Holiday cottages in Wales and Scotland tend to be less expensive than those in southern England. Each accommodation will have a limit on the number of pets allowed per property. The more rural a property is, the better suited it is to holidays with dogs. People with dogs like to be able to take frequent walks and have the pleasure of discovering new places. Families with kids have to compromise because they have both children and animals to keep happy and entertained. A dog-friendly beach is a good option. There are more of these in Scotland, Ireland and in the north than in the south of England. Ireland is also a good value pet-friendly holiday destination except that there is the extra ferry cost and longer drive involved. People know what their dogs and children can cope with. At least with a ferry, it is possible to walk about on the boat and break the long spells of driving. Taking the dog on holiday usually means extra luggage; the dog bed, leads and bowls. At least once you arrive at your pet-friendly cottage or cabin, everyone can begin to chill out and recover. Self-catering accommodation owners who permit dogs to stay with guests are knowledgeable about good local walks and places that you can visit accompanied by dogs. It is often worthwhile to have a chat with the owner before you book a cottage holiday because you can glean so much local information that will also help you make a decision. It is always useful to know that there is a dog-friendly pub within walking distance of the holiday cottage or that dogs are permitted on local beaches and in parks. It might be an idea to read about locations for various pet-friendly holiday lets in Britain. That can also help you make up your mind about where to book that holiday. 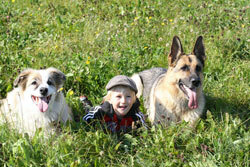 See dog friendly holiday cottages for more information.